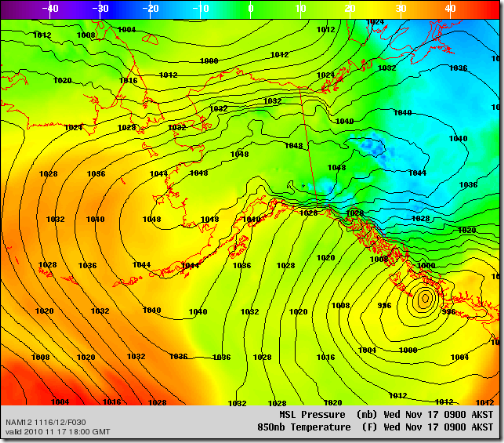 Do you see the 1013 mb low just south of Cordova, and the 998 mb low up in eastern Siberia? Without the chart to look at one might think of lows with that kind of wimpy central pressures to be wimpy themselves. Not so here. The reason is the super strong 1052 mb high in between the two. Look at how the isobars are packed close together in the western Bering Sea and on north into Russia. The closer the isobar spacing the stronger the gradient. The pressure gradient is a force acting on the air. It and other factors (such as friction) determine the wind. Winds over the ocean there are 30-40 kts sustained. Let’s shift to mainland Alaska where the gradient between the super high Bering high and not-so-low Cordova low is bunched up along the arc of (big, powerful) coastal mountains known as the Alaska Range and Chugach Mountains. It is no coincidence that the gradient is bunched up there—it is because the air bunches up there, just like water bunches up above a dam. Water and air both obey the laws of fluid dynamics. Think about the water above a dam…slow, right? What about if the water overflows the dam or if there is a break in the dam? There is a big, powerful acceleration at that point. But the atmosphere is way deeper than even Alaska’s mountains, so how can the analogy hold…the dam is not high enough to block the flow, right? It holds because in Alaska’s big, powerful winter there is a usually a deep layer of cold air near the surface that is extremely dense compared the air above it (which means it is stable, it resists moving up into or mixing with the air above it). Think of molasses flowing under a layer of cooking oil. If it is pushed up a mountain slope by high pressure and tops the dam or finds a break, the pent up force is released and acceleration results. This is the genesis of Alaska’s many bigger, more powerful winds common to coastal mountains, and referred to variously as gap winds, down slope winds, williwaws, Chugach winds, Chinook winds, and Taku winds. These vary in scale but all can reach damaging velocities. Between the time of the map above (3am Tuesday) and as I write this (2pm) the winds have been howling in select places in Southcentral Alaska (select because of their proximity to the mountains and especially the gaps in the mountains). At Palmer the winds are gusting from the north at 40 to a bit over 50 kts with some blowing snow (and/or perhaps dust from the river valleys). If you are more familiar with miles per hour for wind speeds, remember the 7/8 rule, 7 kts=8 mph, and make an approximate adjustment from there. Prince William Sound blow holes are active with close to 50 kt gusts at Whittier and peaks as high as 74 kts at the Valdez airport. Cordova Airport is reporting gusts of 20-25 kts but just east in the Copper River Delta you can bet it is blowing at least 2-3 times that…the delta is one of those gaps, and yes, a big and powerful blow hole even for Alaska. 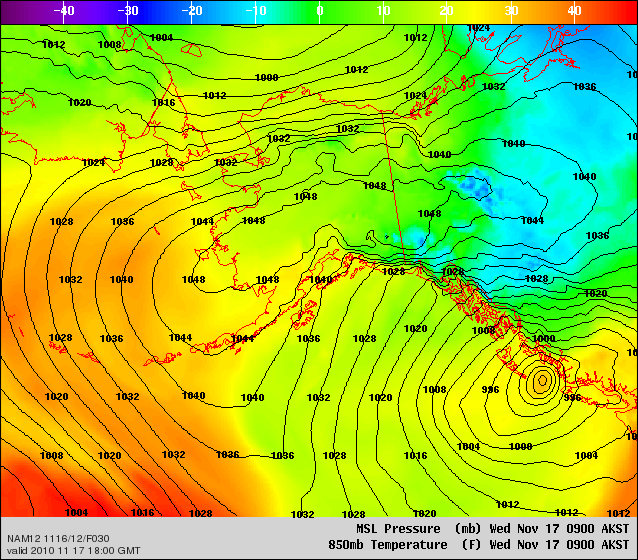 Down here in Southeast Alaska we have more gaps and channels to funnel that cold, dense air than we can keep track of. They each have their favored pressure gradient orientation, adding yet more complexity. Skagway is windier on average than Haines, but right now Haines is a bit windier. Currently it’s gusts to 22 kts at the airport, but somewhere in the valley it must be stronger, since the area is filled with suspended silt, raised from the snow-free river bed (the automated wx station is reporting 1-1/4 mile visibility in Haze). Out at Eldred Rock, in the highly channeled Lynn Canal, north winds are presently sustained 30 kts with gusts to around 45. But the strong gradient is not here yet. Expect all these winds to about double by tomorrow. Take a look at the computer forecast surface chart to see why. This is the same chart as the top one, surface pressure patterns, but also with color-coded temperatures (for a bit above the surface). It is forecasting the patterns for 9 am Wednesday. By this point the super high Bering high has stretched east through middle Alaska and on into the Yukon, and only weakened slightly. The Cordova low on the other hand has been assimilated into a pacific bomb that rushed the BC coast only to stall in Queen Charlotte Sound. This has set up an amazing 75 mb gradient between it and the Kluane, YT region, and will visit more wind power over the coastal area between the two extremes than mere humans will be able to calculate. The NWS has high wind warnings, or at least advisories, up for most SE communities, and gale or storm winds for virtually all the marine waters. Welcome to winter in Alaska. Speaking of winter I did promised an outlook for the whole winter, not just the next day. It’s coming this week. Stay tuned. Meanwhile, I’d love to hear your comments or questions on this or any story via the comment link below.